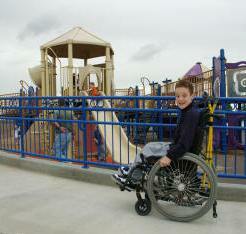 Featured accessible playspaces | KaBOOM! Take a tour of our featured accessible playspaces! Idaho's first universally accessible playspace, constructed during a community build with over 300 volunteers, was designed with the mantra "Dream Big!" in mind. Designed for all of Knoxville's children - including young Ashley Nicole - this playground was named the Best New Facility in 2005 by the Tennessee Recreation and Parks Association. This four-acre outdoor learning environment was designed by the former Director of North Carolina State University’s Natural Learning Initiative, landscape architect Robin Moore. The Norwegian fairytale about a perilous journey and a prince-turned-polar bear is the basis for this playground, designed by a Danish landscape architect specializing in natural spaces for children. A community project inspired by the 100th anniversary of Rotary International, this playground is located at a school serving children ages 4-23 with physical, mental, and emotional disabilities. Conceptualized, planned, and maintained by select courses of St. Cloud State University's Democratic Citizenship course, this playground is an ever-evolving asset to the community. The first universally accessible playground in the Western United States, Shane's Inspiration has grown into an international non-profit organization working toward improving the lives of children with disabilities. An accessible beachfront, pier, picnic area, and playground earned this park a da Vinci Award from the Michigan chapter of the National MS Society for empowering those with disabilities through design. Outpatient visitors to The Children's Hospital Northwest Facility are able to enjoy this sensory-rich environment along an open-space trail with their peers from the community.